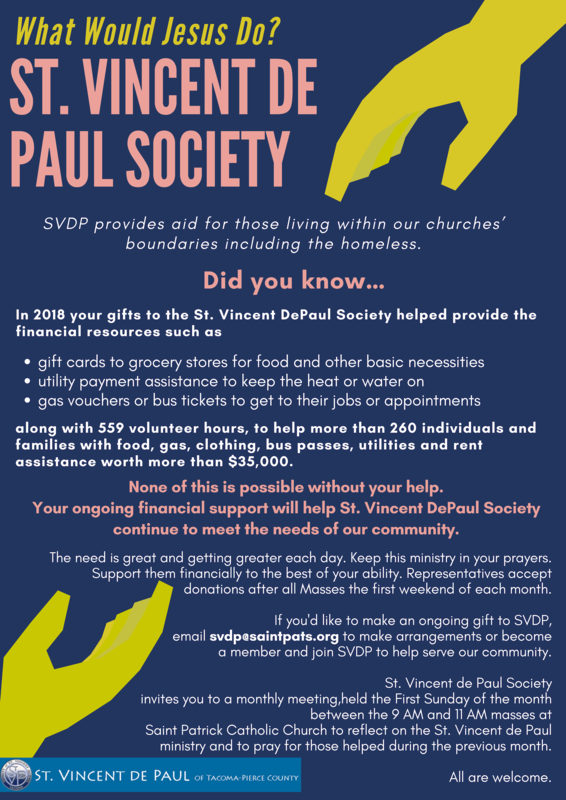 Inspired by Gospel values, the Society of St. Vincent de Paul is a Catholic lay organization, that leads women and men to join together to grow spiritually by offering person to person service to those who are needy and suffering in a tradition of its patron, St. Vincent de Paul. Members are at the Parish Center each Tuesday and Thursday in the St. Vincent de Paul (SVDP) office from 10:00 – 12:00 P.M. returning calls to those in need and providing direct assistance to the poor in our community. The SVDP chapter at Saint Patrick Catholic Church, part of St. Vincent de Paul – Tacoma Pierce County participates in the Stuff a Truck campaign and Walk for the Poor event as part of the ministry’s social outreach. General meetings are held the third Wednesday of each month at 8:30 A.M. inthe Fireside Room of the Parish Center. St. Vincent de Paul Conference of Saint Patrick Parish invites you to a monthly meeting, held the First Sunday of the month between the 9:00 A.M. and 11:00 A.M. masses for a time to reflect on the St. Vincent dePaul ministry and to pray for those helped during the previous month. Make your donation or set up an ongoing gift to St. Vincent de Paul to help those in need in our community. All donations are tax deductible. Donations are also collected after Mass on the first weekend of the month.